The refurbished warehouse unit at Magna Park. 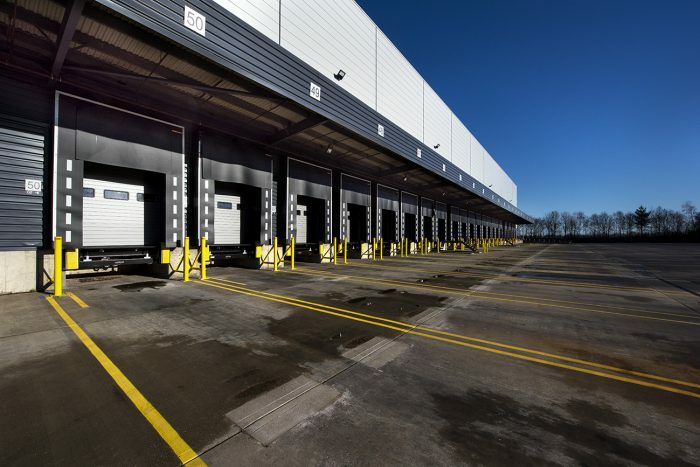 Construction contractor MCS Group has completed the multi-million-pound re-modelling of a 380,000 sq ft distribution centre at a major business park in Leicestershire. The company was appointed by owners Aberdeen Standard Investments to carry out the extensive refurbishment of a former Argos warehouse at Magna Park in Lutterworth. The £7 million project involved the demolition of existing mezzanine structures, removing an extensive racking system, installing new dock leveller doors and curtain walling, a new internal office suite and improvements to the car parking facilities. Work also included the removal of 41,000 holding down bolts from the concrete slab and making good. Significant roofing works included replacing over 200 roof lights and overhauling and re-commissioning 76 smoke vents. The whole roof area was ground down, cleaned and recoated to give a 20-year guarantee and all the wall cladding to the whole perimeter – which is over one kilometre long – was cleaned and re-sprayed to a modern standard. MCS Group also replaced 50 sectional overhead doors and dock levellers, stripped out the four storey offices and re-configured the whole building including new M&E services, new curtain walling, new lifts, toilets, circulation areas and office space. Group development director Tim Perkins said: “This was the largest re-modelling exercise we’ve ever been involved in and it’s great to be able to hand it over to our client as a completely refurbished unit ready for its new occupier. The unit became vacant in 2017 when Argos moved its distribution operation to Kettering.